Limes are a citrus fruit that are grown on trees. Limes are extremely tart and very similar to lemons. 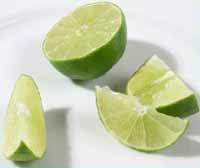 They are distinguished by their color and size; limes are green and smaller than lemons. "Key Limes" which are grown and used in most parts of the world, are native to Southeast Asia, and were brought by Columbus to the West Indies. They grow on tropical citrus trees that reach a height of 15 to 20 feet and are very sensitive to the cold, so in the United States are grown in states with warmer climates, including Texas and Florida. The Persian or "Tahiti Lime", also grown in the United States, is a hybrid developed in the early 20th century. This lime is larger than the Key Lime, and is more resistant to disease and pests. Limes are rich in Vitamin C and Vitamin A and were carried onboard ships to prevent the disease of scurvy in sailors, which was sometimes caused by long sea journeys without fresh fruit or other sources of vitamin C. This was commonly done by British sailors during the colonial and imperial eras, which gave them the nickname "limeys." This page was last modified on 21 March 2016, at 13:54.